A set of 10 digits (0, 1, 2, 3, 4, 5, 6, 7, 8, 9) which are effectively used worldwide is proposed for global communication in this website. One syllable signals are proposed to denote meanings of digits for easy understanding. 'ta' signals health oriented clinical records which is related to kb2 (criteria and recorded indications for health care). 'ma' signals digital names of human body and its parts (kb1). "ta"-"ma" linkage is the essential basis for appraisal and planning of health care as well as licensing of care personnel. 'mi' signals human body and parts of a care personnel, and 'me' signals everything that surrounds care personnel in the setting. "mi"-"me" linkage is the key for appraisal and planning of optimum health care settings including hospitals/clinics, equipment and instruments. The global health care system needs 0 based reasoning with digital order that is oriented to two goals: 1) health for one and all, 2) optimum use of human bodies and earth resources. Almost everyone knows how to calculate and appraise conditions with 10 digits therefore well-ordered digital sets are a global basis for learning with terms in health care records and procedure manuals. A health oriented index for all recorded interventions provides a constant orientation toward +0 (health). Pd conditions are the 0 conditions for use of human bodies and associated earth resources. Pd orients us to 0 (zero) in terms of the least waste of 1) body effort, and 2) earth resources to achieve desired outcomes. The final goal is 0 (absence of need for health care). Need for intervention is - (minus or unwanted). Interventions are indexed from -0 to -9, where -0 denotes collecting information on body status and -9 denotes a removable replacement for a body part. Digital sets can’t be identified with digits. Therefore simple sound (= one syllable) is prefixed to a digit for easy and clear distinction. 2) ‘t’ for energy-based factors. These consonants are chosen because they are; 1) the least variable consonants among languages, and 2) easy to pronounce. Digital terms are signaled by syllables and/or the letters x,y,z and t. The syllables differentiate the meaning of digital terms and facilitate vocal or written communication in digital terms. ‘mi’ – skill anatomy –ie. body sections, positions, surface lines and points, etc. Both prints (for eyes) and sound (for conversation) are needed for global communication. Global sounds for digits proposed here are easy to learn and easy to pronounce for everyone particularly for non-English speaking people. The sound of each digit is a combination of one consonant and one vowel. The consonant for digits 0, 1, 2, 3 and 4 is ‘l’ as in lap, and “p” as in part for digits 5, 6, 7, 8 and 9. Five cardinal vowels (ie. a, e, i, o, u) which are used in most mother tongues world wide are assigned in the order of the place of the tongue tip in the mouth, moving in a circle that begins and ends with “a”, that is sleeping (relaxed) tongue or zero position. Many excellent anatomy books exist, so that we need a good reason to offer an alternative approach. We feel that the subject of anatomy should be more closely and easily linked to associated knowledge including physiology, pathology, clinical records and skill. This linkage begins with the way we learn anatomy. The terms used for the human body and its parts are now a global concern with the advent of computer networks. Our assumption is 1) that learning is based on computer network programs, and that 2) computer networks are being rapidly adopted in learning institutes and care facilities linked with Internet/Intranet. Our approach may be termed “anatomy based linkage” of all knowledge. Anatomy terms in various regional languages such as Chinese, Latin or English are a barrier to global knowledge. People dealing with serious health problems now want direct access to global knowledge, which links directly with local and personal information. Many are favoring Latin-based or English terms or codes derived from these terms as the global standard for anatomy. English is widely used as a second language especially in commerce, introductions of subjects and orientation toward a common interest. It is convenient for those purposes. However we need global terms that provide better linkage for both learning and use. For medical students, anatomy is the first entry to the health care field. Though the health care field is considered to be a science, traditional Latin-based terms used in anatomy are not scientific. They do not help medical students to acquire 3D perception, nor deductive line of reasoning for linking anatomy to other associated subjects required in the health care field. The existing terminologies based in regional languages cannot be eliminated, but it is time to offer an alternative as a core for global standard and communication. Global anatomy is based on 1) computer networks and 2) numeric order. It maximizes use of imagery –photos, graphics, xyz coordinates and measurements. Global terms of anatomy removes barriers to communication, and we can learn anatomy and use its knowledge with no dependence on specialized terms. Yet it will be easily linked to (but not from) regional terminologies including Mandarin, Latin, English, Arabic, Japanese or their associated codes -ex. ICD, SNOMED etc. Who receives benefits from global anatomy? 1. Potential patients and patients. Global anatomy provides lay people easier linkage between local/personal information to global knowledge. - the easiest way to learn. “mo” is one of eight syllables that signals numeric fields of information. The “mo”-signalled numeric set denotes subparts, planes, lines, and points of anatomic parts signaled by “ma. 1) specifying point-to-point relations between an operator (mi-coded) or an instrument (me & mu-coded) and a task object (ma-coded) for optimal control. 2) locating a plane, line, or point to be perceived as reference for a given procedure. 3) three dimensional measurement of a task object in order to relate specs of procedure, ie. its process to the value of the result of procedure or its product. The indication for the “mo” numeric set is based on the high degree of accuracy required for care procedures. The “mo” numeric set consist of 10 two-digit numbers. It is rare, however, that all 10 pairs are needed to locate or name a point. In the setting & procedure recording form, the first digit 0 - 9 is printed on the top, under which the second digit is entered. As seen above, categories of percepts established by the first digit are arranged from the general to the specific in the order of 0, 1, ….9. This reflects the order of inquiry or investigation of an object starting from layers and surface topography to one specific point. The meaning of the higher mo number is dependent upon the scope set by the lower mo number. For instance, “ma11mo81” denotes “the extreme occlusal point of ma11 (right upper central incisor)”, while “ma11mo4681” denotes “the extreme occlusal point of mo46 ‘infra-gingival tooth surface) of ma11”. For instance, mo1131 denotes a cusp of a tooth, while mo1431 denotes an occlusal groove. (cf. mo31) mo1735 denotes a mesial proximal contact (mo35). The following includes both subparts of man-made objects and subparts of what is produced by natural process eg. bacteria. 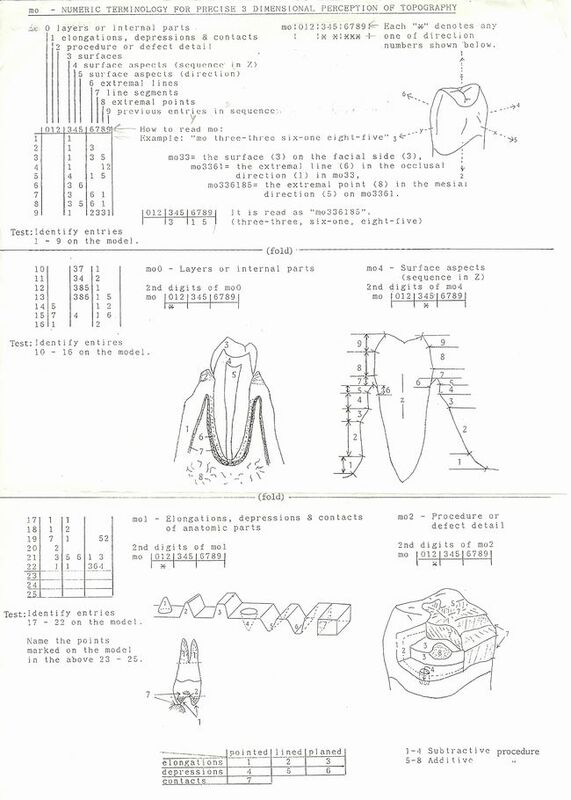 Surfaces of the task object or the subject of procedure are identified by direction numbers in sequence of Z, Y, and X axes of a tooth. The surface aspects of alveolus, gingival, or crown are identified by change of angle against Z axis, in sequence of Z from mo41 at the alveolar border to the surface aspect closest to the occlusal surface mo49. Aspects in a surface or surface aspect specified in mo4 are identified by direction numbers based on change of angle on XY plane. A segment of a line or segment of two-dimensional line pattern is identified by direction number. mo7 is convenient as an indicator of tooth positioning. An example of segment of two-dimensional line pattern would be a segment of mo2531 ie. the restoration margin on the occlusal surface. 70 – reference line segment for a given procedure or line between 2 points. Points are identified by direction numbers. The point is perceived as an intersection of two lines or as an extremal point in a given direction. Copyright© Global Network for Systematic Health Care All Rights Reserved.